Please take a moment to read this note about “10,000 Memories” – the book written by you – the more than 10,000 students who received their diplomas from Mr. Benjamin F. Hurt. Why a book about Mr. Hurt? Order Your Copy of "10,000 Memories" or a video of "A Night To Remember"
"Why a book about Mr. Hurt"
Pat Conroy, one of America's most noted authors ("The Great Santini", "Prince of Tides") recently wrote a book chronicling his lifetime love of reading. In “My Reading Life”, Conroy mentioned a high school teacher that put him on the path of letters. His words could have described the influence that Ben Hurt had on countless boys and girls that were among the 10,000 students that graduated while he was principal. 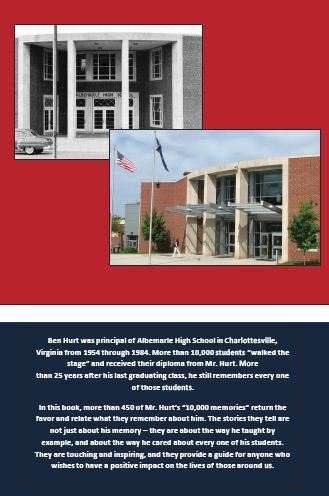 In 2011 more than 500 Albemarle High School graduates from 1954-84 shared the influence that Ben Hurt had on their lives during his 30 years as principal of Albemarle. 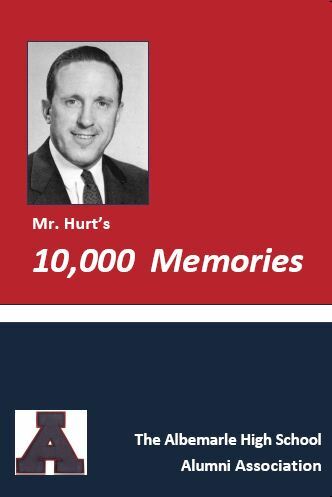 Their stories were complied in the book “10,000 Memories" so we can, in a small way, "notice" Mr. Hurt's impact on thousands of boys and girls. 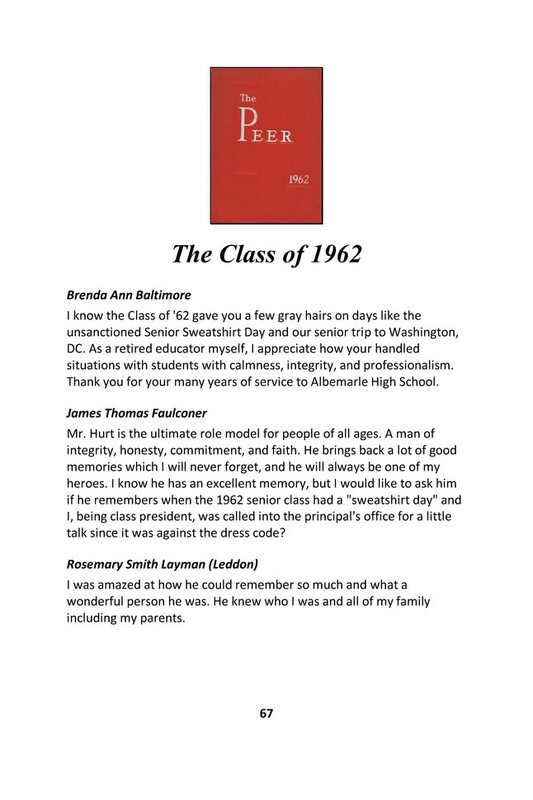 When we decided to collect the memories of some of the students who graduated from Albemarle while Mr. Hurt was principal, we envisioned a “scrapbook” of best wishes, brief memories and anecdotes about his incredible memory. We expected to present the book to Mr. Hurt and his family for their enjoyment. What we got was so much more than that. We have a 230 page book that is full of touching, inspiring, funny and informative examples of how a man who affected so many people lived his life. It is a book that has lessons for us, for today’s educators and for our friends and neighbors. It is not a scrapbook – it is reference book on how to lead a life that positively affects you and the people around you. And, it was written by you and your classmates. There are two ways to buy and all proceeds from sale of the book go to support the Albemarle High School Alumni Association and this website. About 500 AHS alumni and family, or 1 in every 8 people that we were able to reach, took the time to send us a personal example of how Mr. Hurt affected their lives. 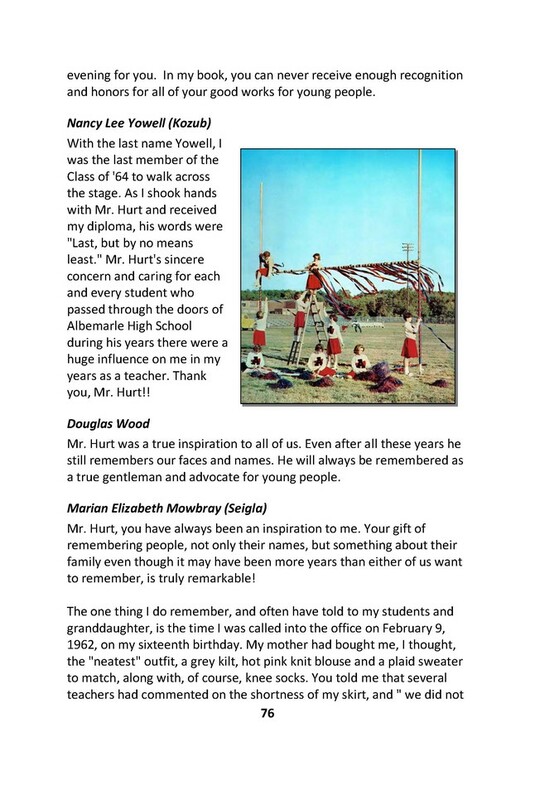 You sent inspiring stories of achievements gained because of Mr. Hurt’s help. You sent touching examples of his thoughtfulness. You sent funny stories about his enforcement of dress codes. You sent everyday examples of the “little things” he did for you as long as 50 years ago, and as recently as this year. And, yes, you did send amazing examples of his memory. Over 500 stories, remembrances and best wishes to Mr. Hurt submitted by you and including your name and graduating year. More than 75 photographs of the school, teachers, clubs and events taken from the annual editions of The Peer from 1954-1984 – including a color image of the cover of every Peer published during the period. Copies of articles, photographs and other memorabilia from Mr. Hurt’s life. Brief biographies of the six members elected to first class of the Albemarle High School Alumni Association Hall of Fame. Information and photographs from the "A Night To Remember" program. Order Your Book Or Video Now! Includes the 230 page book with more than 500 remembrances of Mr. Hurt, 75 pictures from 30 Peers and special momentos of Mr. Hurt's life and career. Also includes profiles of the Hall of Fame members. All proceeds from sale of the book go to support the Albemarle High School Alumni Association & this website. "A Night To Remember Video"
The "A Night To Remember" video is a 1.5 hour DVD of the full program recognizing Mr. Hurt and The AHS Hall of Fame. It includes performances by the AHS cheerleaders, speeches by the Hall of Fame members, remembrances of Mr. Hurt and concludes with his speech to the crowd of 600 members of the Albemarle family. Also includes a copy of the "A Night To Remember" DVD ! The Patriot Edition includes a book personally signed by Mr. Hurt. You will also be recognized for your contribution to the Albemarle Alumni Association by including your name on the "Patriot Edition" sponsors page of this website. A copy of the 1.5 hour DVD of the "A Night To Remember" program recognizing Mr. Hurt and The AHS Hall of Fame. By participating as a "Red & Blue" sponosr, you will receive a personlly signed copy of "Mr. Hurt's 10,000 Memories," a copy of DVD of a"A Night To Remember" and your generous support of the Albemarle High School Alumni Association will be recognized on the Red & Blue sponosrs page of this website.